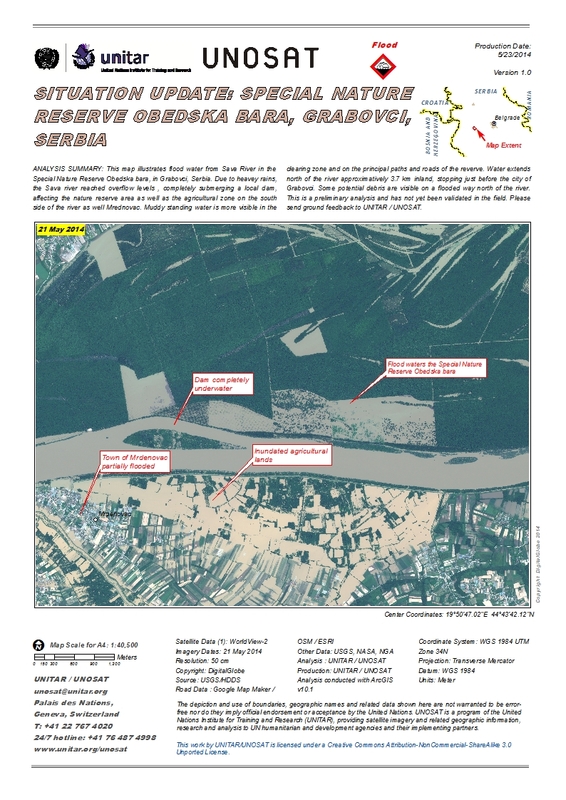 ANALYSIS SUMMARY: This map illustrates flood water from Sava River in the Special Nature Reserve Obedska bara, in Grabovci, Serbia. Due to heavey rains, the Sava river reached overflow levels , completely submerging a local dam, affecting the nature reserve area as well as the agricultural zone on the south side of the river as well Mrednovac. Muddy standing water is more visible in the clearing zone and on the principal paths and roads of the reverve. Water extends north of the river approximatively 3.7 km inland, stopping just before the city of Grabovci. Some potential debris are visible on a flooded way north of the river. This is a preliminary analysis and has not yet been validated in the field. Please send ground feedback to UNITAR / UNOSAT.